Solar precursors correlating solar physical phenomena with the level of future solar activity are much better indicators of progress towards solar minimum -- a broad phase of the solar cycle -- than forecasting a specific event such as the bottom of a broad solar minimum by observing the statistics of numeric values such as solar flux. They're also useful estimators of the future strength of Cycle 25. Here's an example of how one solar precursor -- spotless days -- can be used to assess progress towards solar minimum. We entered the Cycle 24 solar cycle minimum with the onset of eight spotless days in June 2016. We had only 32 spotless days in 2016. We had 15 spotless days in a row in March 2017, followed by relatively infrequent spotless days for the next seven months. The frequency of occurrence of spotless days accelerated in early November 2017 when we had 13 spotless days in a row followed by many more spotless days over the next five months. We had 104 spotless days during 2017. The frequency of spotless accelerated again last month when we had 25 spotless days. We've already had 54 spotless days during the first 25% of 2018. So where are we in our progress to solar minimum? 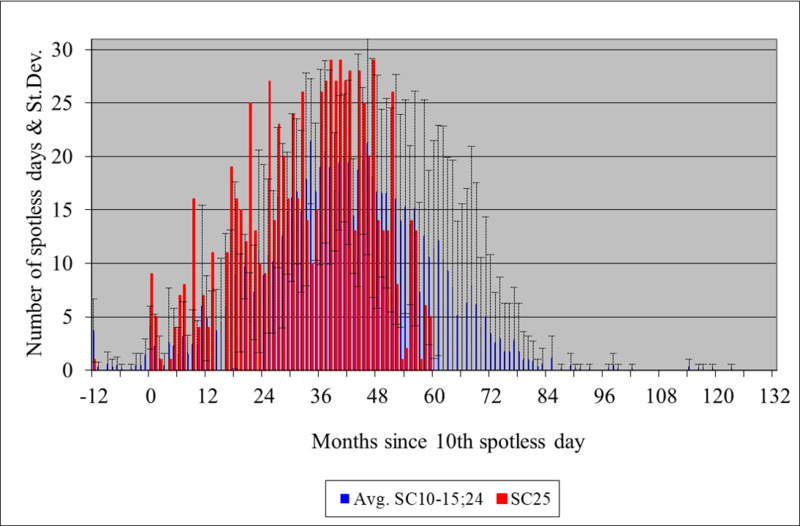 This chart shows the number of spotless days -- in red -- since the tenth spotless day of the onset of solar minimum in July 2016. 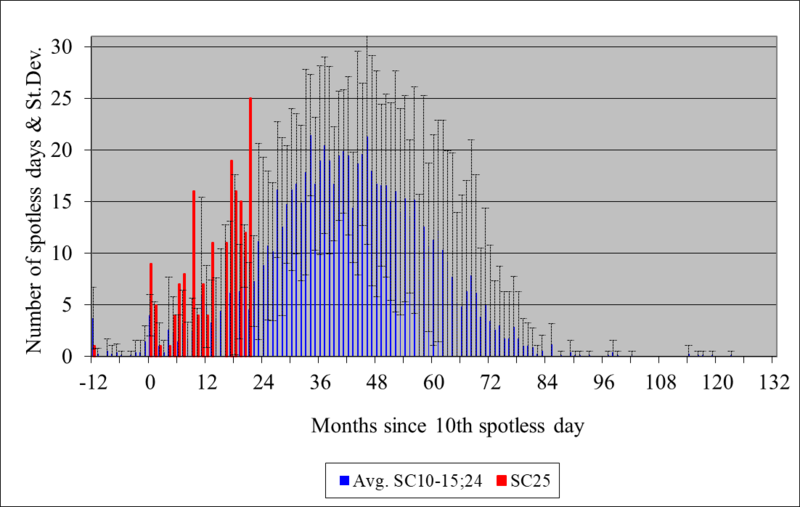 Shown in blue are the average numbers of spotless days during sunspot minimums following weak sunspot cycles similar to Cycle 24. This data suggests that we may have just begun a period of very frequent spotless days for approximately the next two years. The next solar precursor is frequent long periods of spot-free days. We had a 14 spotless days in a row in 2016, 15 in a row in March 2017, 13 in a row in November 2017, and 14 in a row early last month. Long periods of spotless days will become even more frequent as we go deeper into solar minimum. We'll see another important solar precursor after long periods of spotless days become more frequent. New high latitude, opposite polarity Cycle 25 sunspots will then begin to appear more frequently, perhaps by late next year. More frequent Cycle 25 sunspots will signal that we're approaching the bottom of the solar minimum phase of the solar cycle. So what about the intensity of solar cycle 25? An ongoing solar precursor of the future strength of Cycle 25 is the intensity of the solar polar magnetic fields prior to our current solar minimum. The good news is that the solar polar magnetic field strength is already slightly stronger than it was prior to the last solar minimum which suggests that Cycle 25 will be somewhat stronger than Cycle 24. If the long periods of spotless days ends in about a year, it will be a solar precursor of a stronger Cycle 25. If it ends in more than two years it will be a precursor of a weaker Cycle 25.